Hi everyone I'm Jack Red, finally I get to review one of my personal favorite horror movie franchises. Child's Play series has a very strong reputation among killer toy movies with a very passionate fan base. Along with Full Moon's Puppet Master series, Child's Play got me into killer toy movies. Obviously Child's Play series is the most important moves in Killer Toys Collection. I simply couldn't do this without Child's Play or Puppet Master. Child's Play series is still a major inspiration to me to this day. Some of the best written horror movies of the late 80s & most of 90s ever. I really can't recommend majority of these movies to anyone. Believe it or not, it took a long time for me to see the original Child's Play. This was the only entry to be done by MGM as all later Chucky movies are done by Universal. Child's Play gave Chucky such a great voice actor that's still doing the role almost thirty years later. They chose to leave us in suspense almost the entire movie. Keep in mind, the twist revealing the killer still haunts many people's minds. It turns out Charles Lee Ray the serial killer transferred his soul into a good guy doll. One interesting fact is each part of Chucky's real name was taken from a real life murder. This is one of the first voodoo horror movie to not be centered around rituals of that culture. What I meant is in most voodoo horror movies. A tribe of worshipers would curse or kill people to turn them into voodoo zombies. Yes there is a difference between a regular zombie & a voodoo one. In this case, Chucky was taunt voodo that he quickly abuses that knowledge for his own purposes. Which he is still doing to this day. Child's Play was a very good late 80s horror movie. Chris Sarandon plays the detective that was killing Charles Lee Ray. This movie came a few years after Fright Night where he plays Jerry the head vampire. He later cameo in it's first remake to be killed off by that movie's Jerry. Sometime after the release of this movie, Universal bought the rights to this franchise. This was the first Chucky movie I ever seen. Even to this day, Child's Play 2 is one of my personal favorite horror movie sequels. This was a great early 90s horror movie that improved in many ways over the original. Andy from the previous movie got moved into a foster home. Chucky gets some great kills in this movie with people parodying the teacher kill. I would say some of his best lines are in this movie. Also I am a huge fan of the cover art, still my favorite among all Chucky movies. Even Chucky's death topped that of the original. I remember having a recorded VHS tape of this movie with now rare USA channel alternate ending. No lie it plays mostly the same at a different camera angle. They added an incomplete good guy doll head smiling. You aren't really missing much but considering even with the new seven movie collection. Why so little content on the first three movies is beyond me. Child's Play 2 told it's story very well for it's time. I guess I should say it this was my favorite classic Chucky doll look. Child's Play 2 also had some of the goriest scenes in the entire series. Like when Chucky was forced to pull off his own head before removing the knife blade. Then he forced what was left of that arm right into that blade. This movie does such a great job keeping your interest at a high level. I honestly can't say anything truly bad about this bad. This was stated to be Don Mancini's least favorite entry for great reasons. He with the cast & crew were celebrating the completion of Child's Play 2. Out of no where Universal calls them to quickly get started on Child's Play 3. Now many horror movies in the 90s got rushed out that's no secret. It is actually more common than most people realize. Child's Play 3 isn't particular a good movie but it isn't a bad one either. The best way to describe it is telling you what I like & what I don't like about it. Child's Play 3 had the weakest humor of the entire franchise. Some death scenes aren't great like Chucky scaring an old soldier causing him to have a violent heart attack. Also due to the big time skip a different actor got to play Andy Barclay. He wasn't a good replacement for Alex Vincent who was a kid around the time. Personally I wouldn't chosen to set a Chucky movie at a military school. Believe it or not, they got permission to use a real military school for this movie. Yes Chucky does get some rememberable lines like "This means war!!! or Oh Andy how much you grown." There's no way around it, Chucky's death in this movie is my favorite. I liked it so much that I made sure it was the front cover of Killer Toys Collection. Chucky does a good job to stand out in a good way. Bride of Chucky was among the first pay-per-view movies I seen. This is more recently seen as a mixed reception Chucky movie. Personally I am a huge fan of it for many reasons. Sure somethings done in the movie may seem like stuff that's already done or not done as well. Bride of Chucky does have one of the best soundtracks of the franchise. This movie also started the thread of Chucky titles instead of Child's Play. Honestly I am okay with it but eventually they will strike out with it. Bride of Chucky also started them moving away from Andy Barclay. I guess they wanted the Chucky movies to be more fresh. This by itself cause some strong negative reactions. Honestly it is good to have some changes. I didn't really mine they left Andy out of this movie. Bride of Chucky has some of the best jokes of the entire franchise. This also had one of my favorite Chucky doll models. I also like this time Chucky wasn't the only killer doll. Yes they introduced his long time lover Tiffy. Easily one of the best late 90s horror movies. The same director of this movie later directed Freddy vs. Jason. Not to insult Chucky fans but that movie was way better. I do agree Chucky got some great kills. I kinda like some of Tiffany's kills with the famous mirror scene being my favorite kill of the movie. 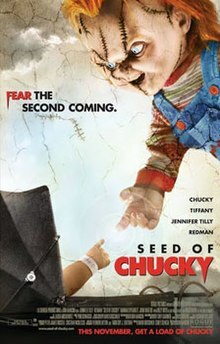 I didn't think they would strike out so soon with Seed of Chucky. I already did a long review of this movie in another blog ripping it a part from limb to limb. So I am not going to say much but for those curious I will link it down below. Curse of Chucky is great for direct to video sequel. Which is filled with so many bad horror movie sequels greatly out numbering those that hit theaters. Brad Dourif's daughter Fiona playing Nina whose mother had a connection with Chucky. Honestly I really didn't like the fake Chucky face mask. I do like how they went about exploring more of his back story. Curse of Chucky is way better than Halloween 6: The Curse of Michael Myers both versions. This movie does mostly take place in one location. There does exist similar angle horror movies that's worth mentioning. I would say some of his kills are some of the toughest to swallow yet. He sneaks on one of the bowls for dinner some rat poison that led to a horrible car accident. Of course you knew it wasn't an accident come on. Chucky does a great job making Nina look crazy. This is one of the few times Chucky wins. There is an alternate ending that further expands the concept of her looking crazy to people. Curse of Chucky comes with a strong recommendation. It so happens to be on Netflix. I don't have many issues with this movie. Curse of Chucky really made up for Seed of Chucky. I also believe they went this route to have more control over the movies they're making. Hands down one of the best among all the Chucky movies. This also seems to be a mixed reception movie among fans. I would say please check this movie out. Cult of Chucky got pirated online a few days before it's DVD, Blu-ray and Netflix's release. I heard some scenes aren't present on Netflix version. They also tied in a new seven movie collection with the actual case looking like a good guy doll's box. This is more of a mixed reception Chucky movie. I believe it is due to the big two twists late in the movie. Yes there is spoilers in this review. There's technically four Chuckies in this movie I'm not kidding. Andy makes a full return after the cameo in a post credits scene in the last movie. He so happens to kept the original Chucky head. Chucky found a new voodoo spell allowing him to take control over several good guy doll's bodies at once. In other words, within Harry Potter universe only two characters created the horcruxes. Which involves splitting your soul into several things with particular ways of destroying. This does allow the user to keep reviving themselves with some difficulty. However because it is against many rules of reality. Over time the overall soul quality will break down. Which that part of the rule should imply to Chucky as well. Yes the cult that gets hinted was mostly Chuckies with Tiffany being one of the few members that isn't Chucky. Cult of Chucky is a movie I would say you should watch twice or thrice. Before you decide if you like it or hate it. I noticed so many people judging it on the first watch not fully realizing everything going on. Sorry if I don't take a lot of them seriously. This is an underrated Chucky classic that some people would enjoy. Especially if you are a Chucky fan or you so happen to be into killer toy movies like me. This is one of the craziest direct to video sequels I have ever seen.